11 November 2018 marks the centenary of the end of the First World War. To commemorate this, we take a look at the contribution of the staff of the University War Hospital at the Highfield campus site. Under the command of Dr Lauder, who had been the Medical Officer for Health for Southampton, the Hospital was staffed by professional nurses and members of the Volunteer Aid Detachments (known as VADs). As well as nursing, VADs also worked in a range of auxiliary capacities from driving ambulances bringing the wounded to the Hospital, to laboratory assistants, clerks, cooks, housemaids and laundresses. 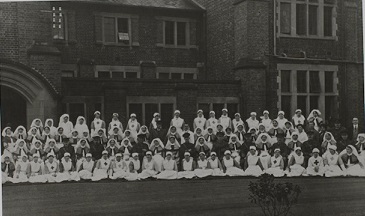 With the start of the war, Southampton hospitals recruited every nurse, VAD and others who could be spared from auxiliary hospitals in the surrounding counties. But as the war progressed, the need for further staff increased. Gwynnedd Lloyd, a friend of the daughters of Dr Lauder, was considered too young as a 17 year-old to volunteer in 1914. However, in the aftermath of the battle of the Somme, she was invited to join the VADs and to work at the University War Hospital. The VADs lacked the training and skill of the professional nurses and tended to perform duties that were less technical. As a new VAD, Gwynnedd Lloyd noted that her duties consisted of “making beds and waiting on sister” as well as taking trolleys around and twice a day collecting rubbish. But as time went on, with the flow of the wounded into the hospitals and the demands it placed on the staff, the line between the professional and the volunteer became far less distinct, leading to recognition that the VAD and nurse differed little beyond the level of training. Gwynnedd Lloyd was assigned to assist with one of the hutted wards at the Hospital and even as a relatively untrained VAD was expected to cover shifts of around 10 hours. The women who volunteered as VADs saw their work as a patriotic duty and a useful contribution to the war effort. Whilst some were local to Southampton, others who served as nursing staff at the University War Hospital came from all across the UK, the Channel Islands, Ireland and Canada. It is estimated that somewhere in the region of 4,500 Irish women served as VADs during the war effort, and amongst the staff of the University War Hospital were women from a number of Irish counties including Counties Kilkenny, Limerick, Longford and Tyrone. 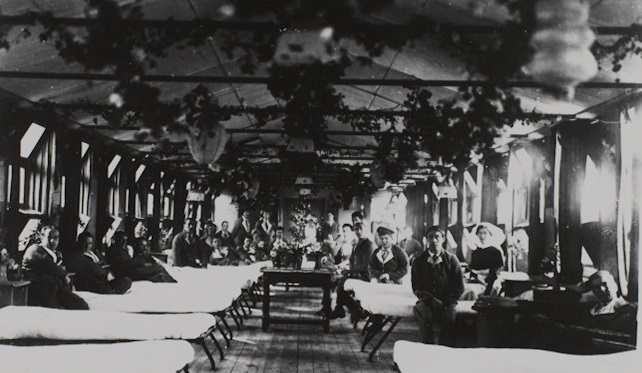 Canadian VADs were initially only employed in their homeland working in convalescent hospitals. However, as the war dragged on, it became apparent that they were needed overseas and the staff at the Hospital in 1918 included a number of nurses from New Brunswick in Canada. Amongst the ranks of the VADs were not only nurses, but a myriad of auxiliary roles such as orderlies, stretcher bearers, clerks, cooks, housemaids and laundresses. Most of the women who served in these roles tended to be from the local area. 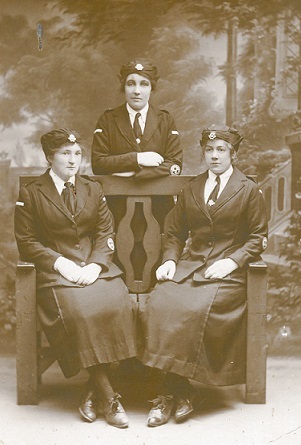 Fanny Street and her two friends, Jennie Ford and Ethel Taylor, who feature in current Special Collections exhibition My War, My Story, were from Southampton. All three worked in the laundry of the University War Hospital for the whole duration, with Fanny Street becoming the Head Laundress by 1917. And we find that members of the same family all worked together at the hospital. Three members of the Trodd family from Southampton and members of the Bailey family from Eastleigh worked as maids and cooks. Annie and Hettie Needham from St. Denys were both employed as clerks. And Barbara and Gertrude Long, who lived in Freemantle, worked as a clerk and a laboratory assistant respectively. The Archives holds a notebook and three scientific reports kept by Gertrude Long during her time at the Hospital (MS101/8). And so, as we come to the centenary of the end of the First World War, we remember all those who made a contribution, not least the young women who, in some cases, crossed an ocean to help staff the War Hospital here at the University. 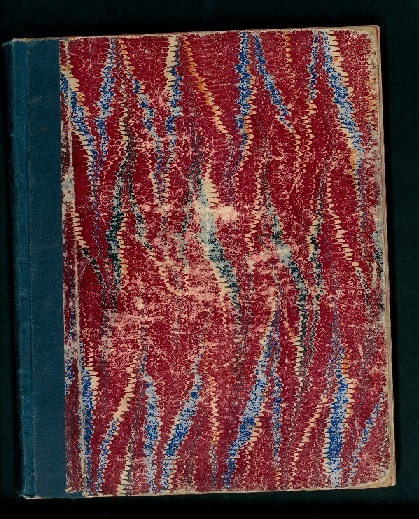 This entry was posted in Exhibitions and Events, Manuscript Collections, War and warfare and tagged Military Hospital, nursing, University of Southampton, Volunteer Aid Detachments. Bookmark the permalink.